Manage a golf course or tournament ... venue or event ... or any outdoor business like estate sales? You need to attract prospects to bring them to your venue or event. Once you do, you need to register them, as well as reach them and staff and volunteers on-site. They won't have their PCs with them on the links. ... But they will have a phone! Revenue Typhoon with mobile leads and marketing is ideal for outdoor venue, event, and business marketing, services, and communications. The rest of this page focuses on golf. But our services apply to any outdoor venue, event, or business ... though there may be limitations if there is no nearby cell phone service! Check out EventLeads.net for specific meetings industry solutions. Your sponsors, advertisers, media and community partners are sending you money, golfers, or both. Give them something of real value in return. A hole sign or listing in a program is empty branding. Instead publish our mobile campaign phone number and give your partners mobile leads direct from the golf cart! It's a breeze for golfers and others to sign up with a simple text message. See more at our Mobile Leads Machine. The only way to reach golfers and staff is through their phone. Use Revenue Typhoon to send broadcast text messages or voicemails for key reminders, news, and promotions. You'll reach golfers immediately, whether they're stuck in traffic, at the putting green, out on the course, or in the clubhouse enjoying a cold brew! You may have hundreds or even thousands of visitors and attendees at your event or venue ... and you don't know who they are! They can be great leads for your service or next event, as well as your partners. Virtually every one of them has a phone. Register attendees by promoting a giveaway, offering an exclusive for registrants, or creating a VIP Club. Announce it live and advertise it at the entrance and you're sure to capture most of them! Charity tournaments often have no web site, no support for partners, and little marketing beyond a late blitz with contacts and golfers from past years. 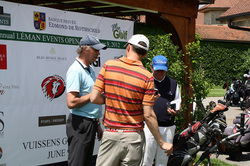 There is no way to reach out and engage prospective golfers and sponsors outside the individual event. Each year it's almost like starting over. It's always a difficult fight to land golfers. In addition active golfers today often receive 20-50 notices a year of business and charity golf events from friends, business contacts, clubs, work, and social networks. It's a competitive market. How do you stand out in this crowd? Make an eagle with Revenue Typhoon Breakthrough Presence. We provide low-cost full year solutions for your marketing and lead and customer communications, including developing and managing web and mobile web sites, apps, and email. Golf tournaments typically secure promotional goods from golf stores, clubs, pro shops, sponsors, magazines, and other merchants. They provide them to participants as door prizes and in goodie bags. Don't give them all away! Instead leverage these donations to create powerful promotional opportunities. Revenue Typhoon helps you maximize giveaways to attract new leads and land golfers with programs like a VIP club and sweepstakes and partner promotions. While your tournament or business may be small, or even just you, you can look look a big company with the Ultimate Phone Service, Your phone number is the gateway to a powerful set of computer, marketing, and PBX services, including voice extensions, call forwarding, recorded messages, and more. We bring deep experience in events like golf tournaments. Visit our sister site at EventLeads.net to see how we can help everyone from attendees to sponsors to the meeting planner. Revenue Typhoon is a complete marketing system that integrates powerful world class marketing and technology. Check out our full service offering to learn how we can increase business every step along the marketing and sales process, from attracting leads to generating customers.